Old Maps of Oakham and Rutland. We have just the one map for Rutland, for Oakham, but we also cover the whole county at the Inch to the Mile scale. 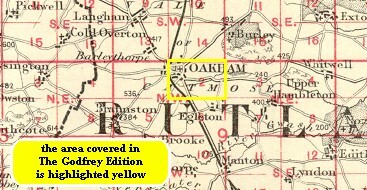 Though the most important town in the county, Oakham was always relatively small and did not achieve borough status. However, the town did have the attributes of a county town, with the Assizes held in the Castle and a good range of shops and offices. Our map captures most of the town, and includes an introduction, along with a good contemporary directory. This index map might be useful. 157 Rutland & Stamford 1906 - published 2002; introduction by Barrie Trinder. Includes a map of Ketton.